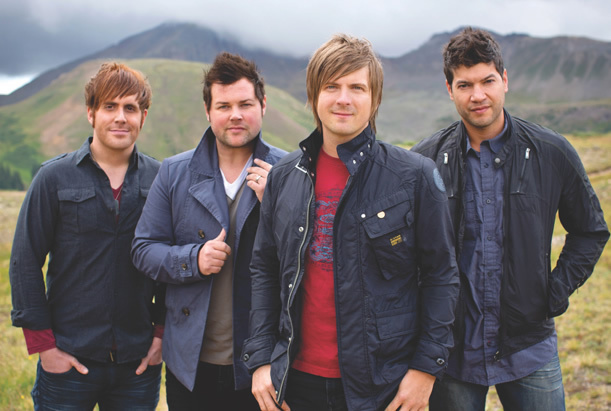 Nashville, Tenn. — Dove Award-winning band, The Afters, have released a brand new single, “Live On Forever”, which is already being played at 40 radio stations across AC and CHR formats. The single, written about Heaven, is the first from their forthcoming fifth studio album, set to release February 12, 2015. “Live On Forever” is now available through iTunes, Amazon and Spotify. Fans can hear the single live this October as The Afters head out on the “Time Of My Life Tour” alongside Chris August, Unspoken and Among the Thirsty. For additional tour information, click here. Texas-based, four-piece band The Afters were propelled into the national spotlight with their INO/Sony Music Label Group debut I Wish We All Could Win. The project spawned the swirling, melodic hit “Beautiful Love,” earning the band an enthusiastic following when the song was selected as the theme track for MTV’s “8th and Ocean.” “Beautiful Love” was also the most downloaded track of 2006 on the iTunes ® Inspirational charts and garnered the band an mtvU award. The Afters’ sophomore release Never Going Back To OK (INO/Columbia Records) debuted in the Top 50 on the Billboard Top 200, and proved to be a sensation on the silver screen with “Grey’s Anatomy” (ABC), “Dr. Phil,” “Army Wives” (Lifetime) and “Rachael Ray.” The band’s third record Light Up the Sky bolstered two No. 1 radio hits, as well as placements on “The Biggest Loser” (NBC) and “You Deserve It” (ABC). A slew of media including Rolling Stone, Seventeen.com, E! News Live, TV Guide, Premiere Radio and more also picked up on covering The Afters. The band released its fourth studio album, Life Is Beautiful in April 2013 via Fair Trade and is currently in the studio recording their fifth studio album, set to debut in February, 2015. The Lord in Heaven must be well pleased with these guys. “Life Is Beautiful” is just one really fantastic song after another, regarding melody and themes. Easily one of my top 20 albums all time, but then I just love a good hook. Can’t wait to hear the new album.